Free BongaCash ticket to TES in Lisbon! BongaCash will become one of the main sponsors of the TES conference, that will take place from 1st to 4th of March in Lisbon! Many exciting discussions, interesting presentations, and hot parties are awaiting you! We will be glad to see each and every one of you at BongaCash stand to discuss our future collaboration plans. You can register for TES 2019 for free if you have a BongaCash account. For additional information, please contact our managers. We are eager to meet you already! Try out the new pre-roll! 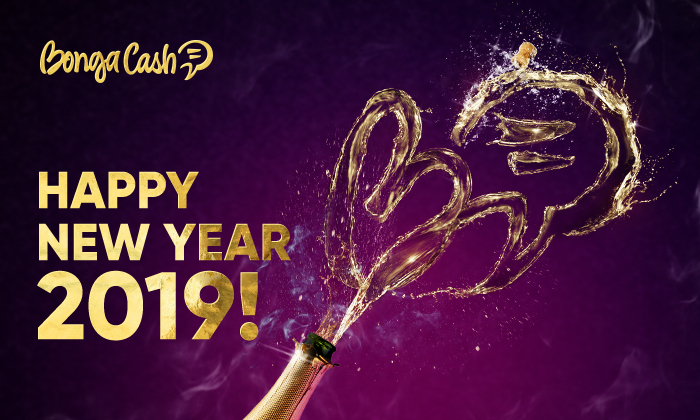 We wish you a Happy New Year and would like to draw your attention to the new pre-roll! You can find it in the Promo tools section of your BongaCash account. Test the pre-roll right now – boost your income! For further questions don't hesitate to contact BongaCash managers. Let the festive mood bring you a lot of beautiful ideas and get you closer to the fulfillment of the most cherished wishes! Expect even more interesting and useful features in 2019! BongaCash office will be closed on January 1 and will reopen on January 2. We wish you a joyful holiday and all the best for the coming year! BongaCash to attend Lalexpo exhibition 2019 in Cali, Colombia! BongaCash team will be one of the main sponsors of the famous webcam conference in Latin America – Lalexpo 2019 – that will take place in Cali, Colombia from 17th to 20th of February. We will hold a drawing of 20 FREE tickets for this event! To participate, please contact our managers. The winners will be selected randomly!